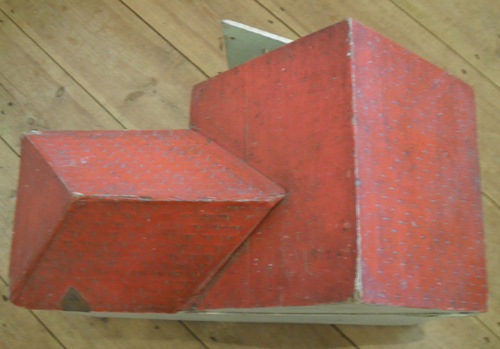 This model was produced between 1930 and 1941. 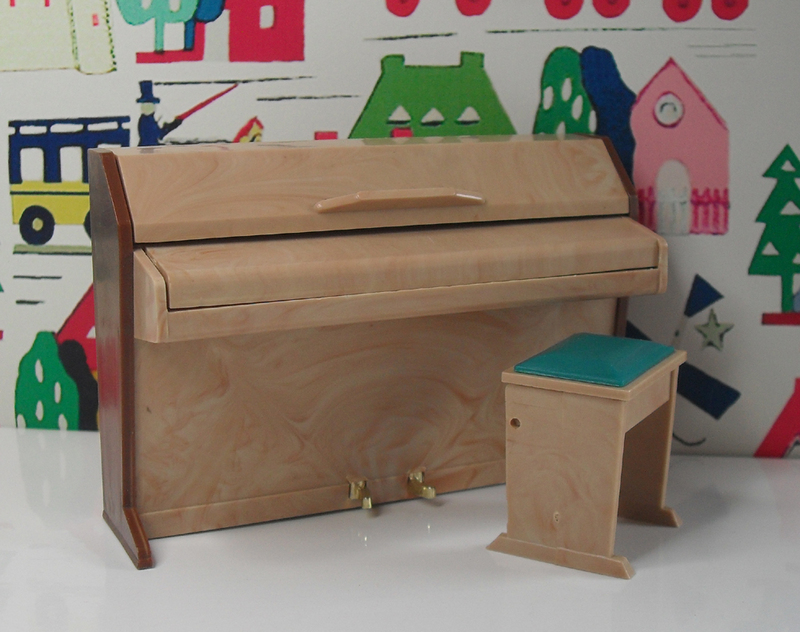 This is the new addition to my doll’s house collection a Triang No.24. It is a lovely looking house with brick facing and a porch/arch around the door, and a window box under the top window. It has 4 good-sized rooms. 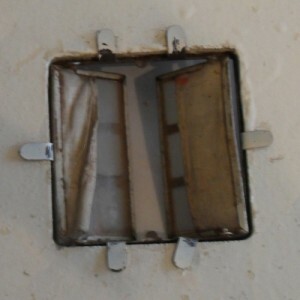 Although not all the windows are complete, each window has a frame which is a bonus, as inserts can be sorted out later. 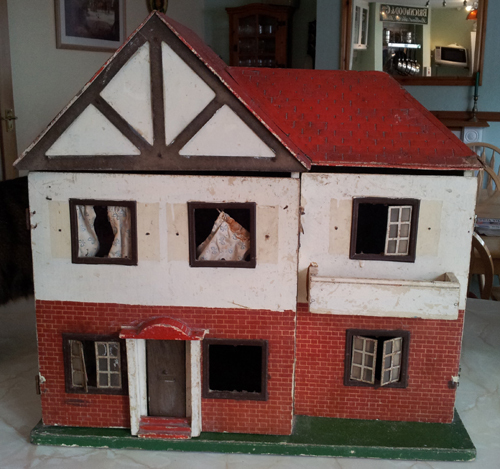 The main problem with this house is the woodworm, luckily the front panels have no worm holes. 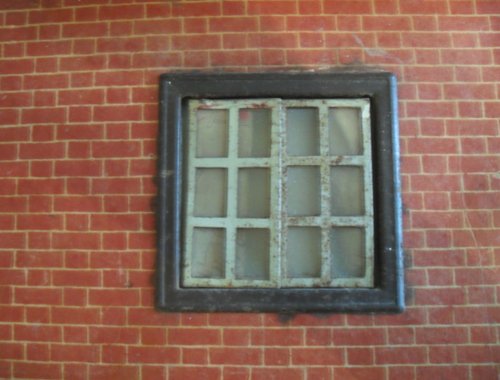 The upstairs windows had shutters on either side of the windows, I had made some of these for one of my other dolls houses, so they will be no problem to replace. 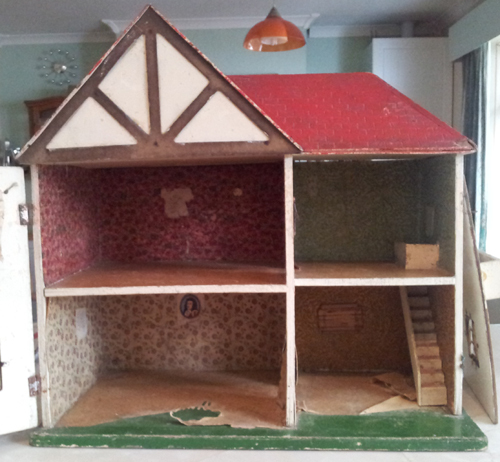 This shows the inside of the house, it looks a bit untidy at the moment. 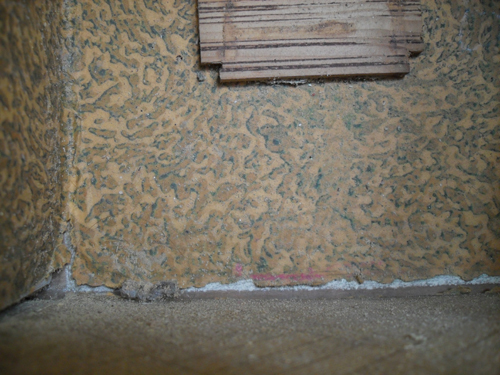 The above picture shows one of the walls of the house which is full of woodworm holes and dust, the middle of this piece of plywood is as thin as paper where it has been eaten through. Each layer has separated, this is the worst area. 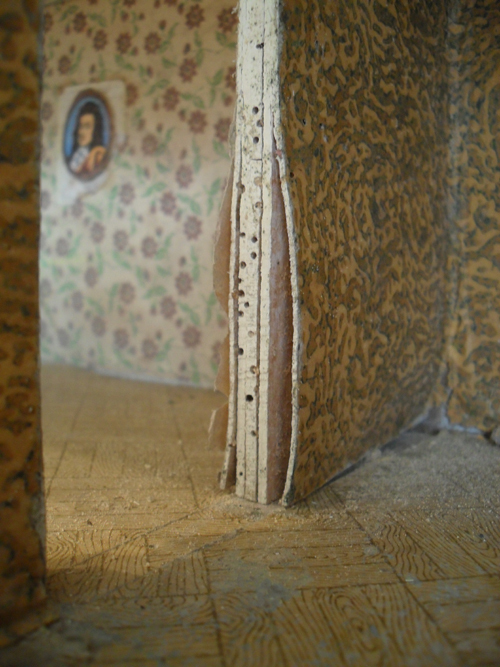 All the wooden carcus of the house shows signs of woodworm. 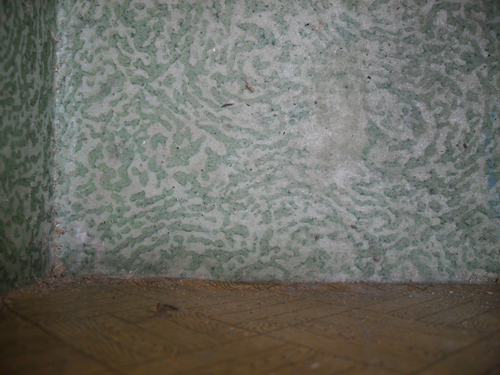 I have tried to gently remove the wallpaper so the wood could be treated, but this was not successful, so I have been treating the house with a syringe, putting woodworm treatment in each hole, and soaking the edges of the house. 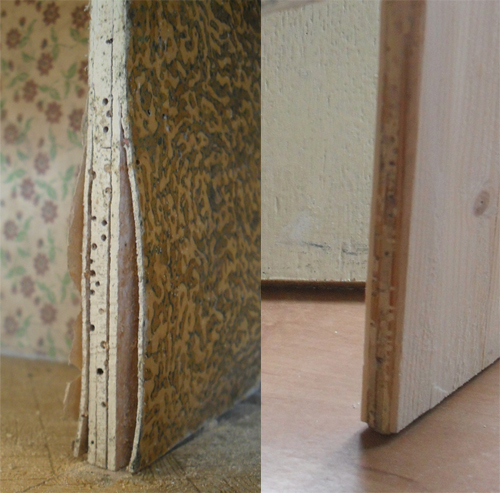 What I hope to do is to fill each hole with PVA glue, the walls do not feel spongy so I hope this idea works, what fun. 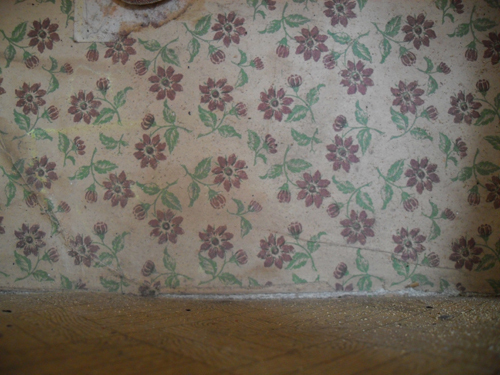 The pictures above show the wallpaper, although at the moment it all looks a bit tatty, I am sure I can tidy it up. I am still trying to convince myself of this, as I don’t know quite where to start. 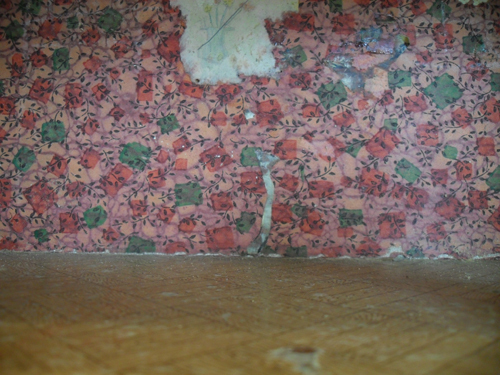 Some of the walls have paper stickers on which will have to be gently removed. I think a few well placed framed pictures, or high pieces of furniture, will cover up the very bad pieces, nice rugs on the floor will cover up the worm holes and the scuffs. I have been working the floor paper, so I might replace it. The windows are very rusty and will need to be completely restored. Each insert has a little piece of curtain, but I am not sure I will have enough to make out the pattern as they are very faded. I am not going to change the brick paper on the front panels, as it is in quite good condition, and will add character to the house. The roof is complete and is made of plywood with a tile pattern stamped into it, but I will have to take it apart to check for woodworm, but it shows no real sign. There is also a metal Triang label on the roof, a little rusty.